Adapters - Curbs Plus, Inc. The CPT-1 Transition Curb is fast, efficient, and reliable. Our adapters arrive ready to install without the hassle of needing to be field assembled. 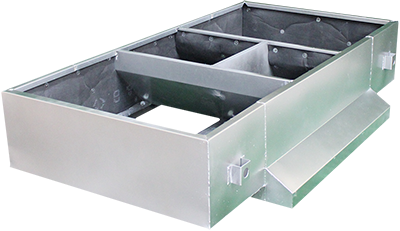 We design the CPT-1 to provide maximum airflow, thus saving money in operating cost over the life of your new unit. With the heavy gauge construction to the prime painting our adapters are designed to last. REPUTABLE SOURCE: Curbs Plus, Inc. sets the standard when it comes to adapter construction and performance! SPEEDY PRODUCTION: 5 day standard build in most applications and if you need it faster, just let us know. GREAT CIRCULATION: Designed for maximum airflow. AMERICAN MADE: Heavy gauge G90 prime galvanized steel that is sourced domestically used in each of our manufacturing facilities. RUST RESISTANT: All primary welds are cleaned and cold galvanize treated, and exterior surfaces are vertical or sloped to ensure that no water will pool, preventing rust problems associated with other adapters. MOISTURE PREVENTION: We fully insulate the walls, floor and transitions so your adapter does not sweat. DURABLE: We fully prime paint the entire adapter to help it withstand the elements, unlike those other adapters. EASY INSTALLATION: We help make installation easier by providing fully welded lifting lugs on every adapter.